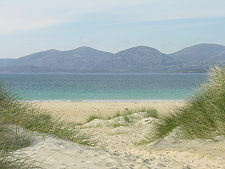 Harris is famed for its beaches. In truth, a fair part of its highly indented coastline is very rocky. 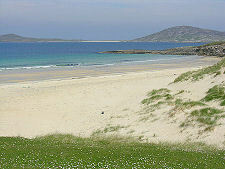 But where the coast of Harris is sandy, it does offer some of the very best beaches you will find anywhere. 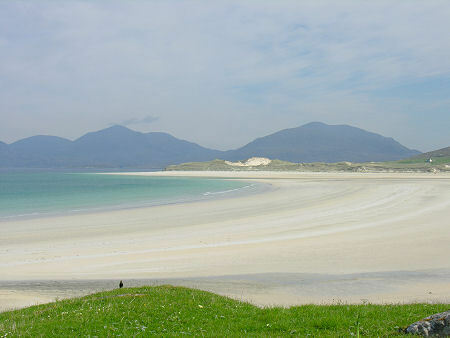 And perhaps the best of them all, certainly the largest and the most spectacular of them all, is Luskentyre Beach. Luskentyre Bay bites deeply into the west side of South Harris a few miles south of where it almost becomes an island at Tarbert. At high tide much of the bay is submerged, becoming part of the Sound of Taransay and looking out to the island of Taransay, one of the most scenic of Scotland's islands. Luskentyre is a sparse settlement scattered along the course of the minor single track road that skirts the north side of Luskentyre Bay. 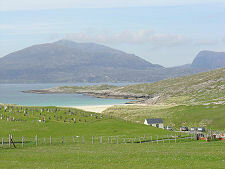 A few farmsteads, a few holiday homes, two graveyards and... And sand. 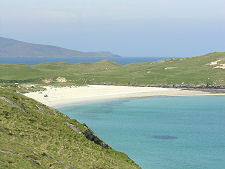 The views across Lusketyre Bay from the early part of the minor road will probably give your first taste of Luskentyre Beach. These do have a certain "wow" factor, but you will (hopefully) be looking into the sun and there are better places from which to appreciate the beach. En route along the north side of Luskentyre Bay you pass some truly vast sand dunes which obscure the view of the beach, before the road ends in a small car park. 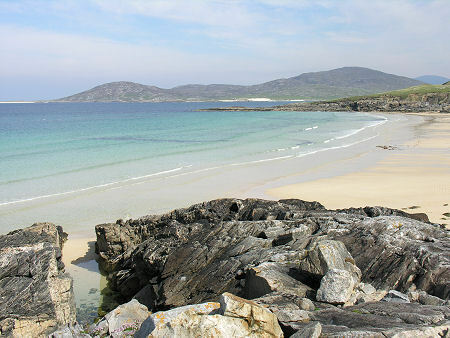 A path continues north west to Tràigh Rosamol, a beautiful beach that is in effect a northern continuation of Luskentyre Beach facing north west past the island of Taransay to the mountains of North Harris. To really appreciate why people rave about Luskentyre Beach you need to return to the main A859 and head west along the south side of Luskentyre Bay. 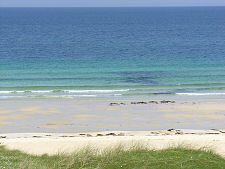 The best views are gained a little beyond Seilibost School where you can look north along the line of the dunes and the sand bar that extend out into the mouth of the bay from the south. In the right weather it is difficult to imagine there is a better beach anywhere. 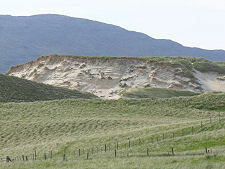 The beach curves around to the west, punctuated by the vast dunes on the north side. The background interest is provided, once more, by the North Harris mountains. 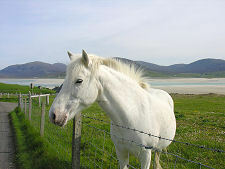 If that was all that Luskentyre had to offer, it would be far more than enough. But over the next couple of miles of coast road, you pass a series of much smaller beaches, especially those either side of the headland at Àird Niosaboist. Each of these is a gem in its own right, each offering different variations on the same theme. 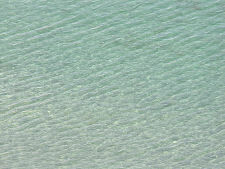 And what a theme it is: with the stunning blues and turquoises of the sea set against the near whites of the beaches, the different blues (ideally) of the skies, the greens of the grass and the greys of the rocks. Coastal scenery really doesn't come any better than this.